I am not a huge fan of traditional creamy coleslaw BUT I love love love this cashew coleslaw! It is sweet and tangy with the perfect amount of crunch and texture, and comes together in minutes! I made this Cashew Coleslaw as a side dish, then couldn’t stop eating the leftovers for lunch the next day! Cashew Coleslaw is the perfect recipe alternative to traditional coleslaw. Maybe I have blocked a negative creamy coleslaw experience as a child, but if creamy coleslaw is on the table, I pass it right by. Not so with Cashew Coleslaw. I literally could not stop eating it. I made it when friends came over for dinner and only stopped heaping it on my plate because I was trying to act ladylike. The next day however, I finished if off! By myself. Didn’t even ask if anyone else wanted any! I like a lot of texture in my salad and I especially love adding nuts to my salads. I also prefer a vinegar-based dressing on salads to mayonnaise-based dressing. 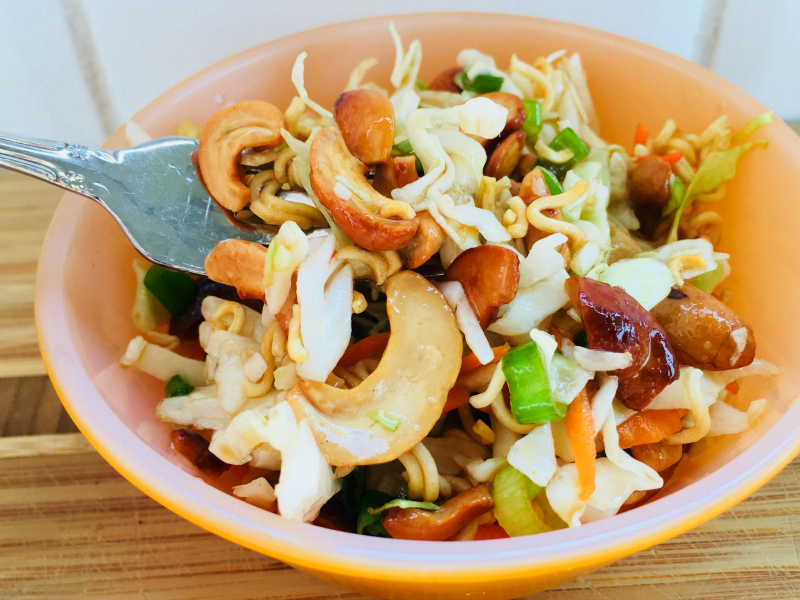 So basically, this Cashew Coleslaw salad is perfectly suited to me, and maybe to you too! Let’s take a moment to admire my first Fire King purchase: 3 little vintage bowls for $2! I am in love with them! 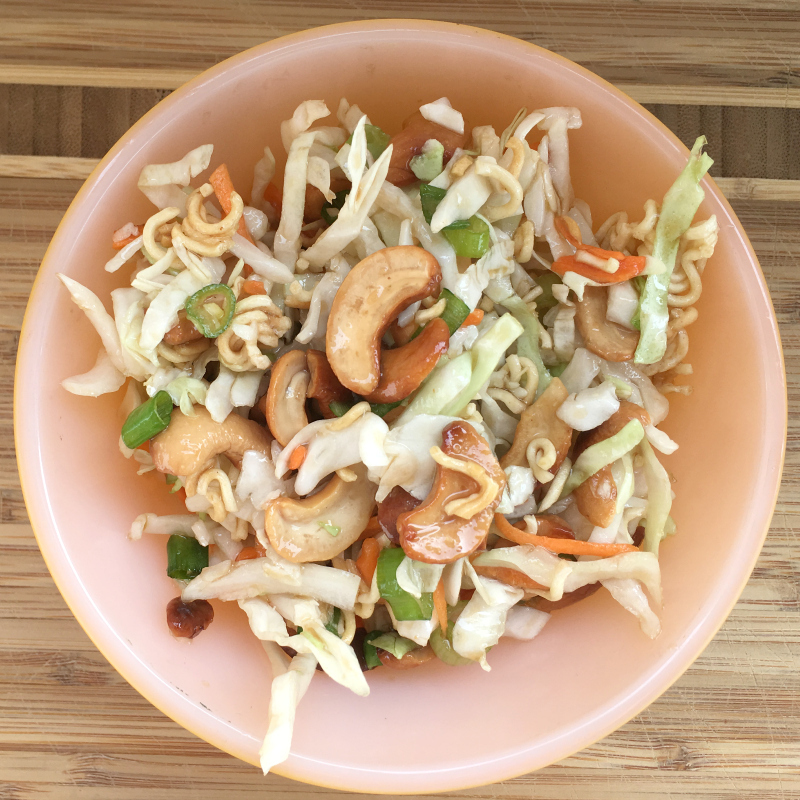 No need to belabour the point: I love Cashew Coleslaw and can’t wait to share the recipe with you! Hope you like it! Sweet and tangy, crunchy and delicious, this Cashew Coleslaw recipe comes together fast and will become your new favourite coleslaw! Put cashews and noodles on a cookie sheet and toast at 350 degrees for about 8 minutes until golden. Mix these together for the dressing. 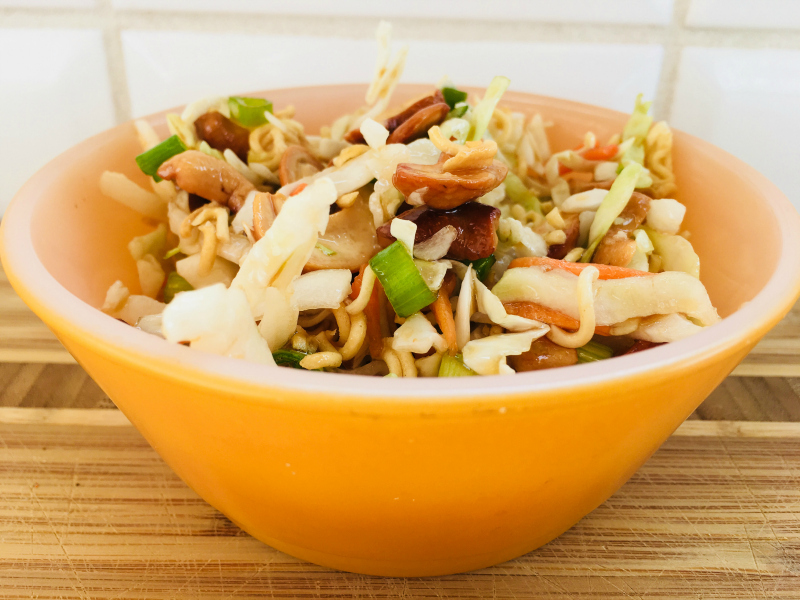 Mix nuts, noodles, coleslaw, green onions, and dressing together in a bowl. You can do this a bit ahead of time and let it sit for the flavours to blend together. Wow. Another recipe that I am going to go nuts over. (Get it? cashew-nuts) oh, well, thanks for a great recipe for me to try. 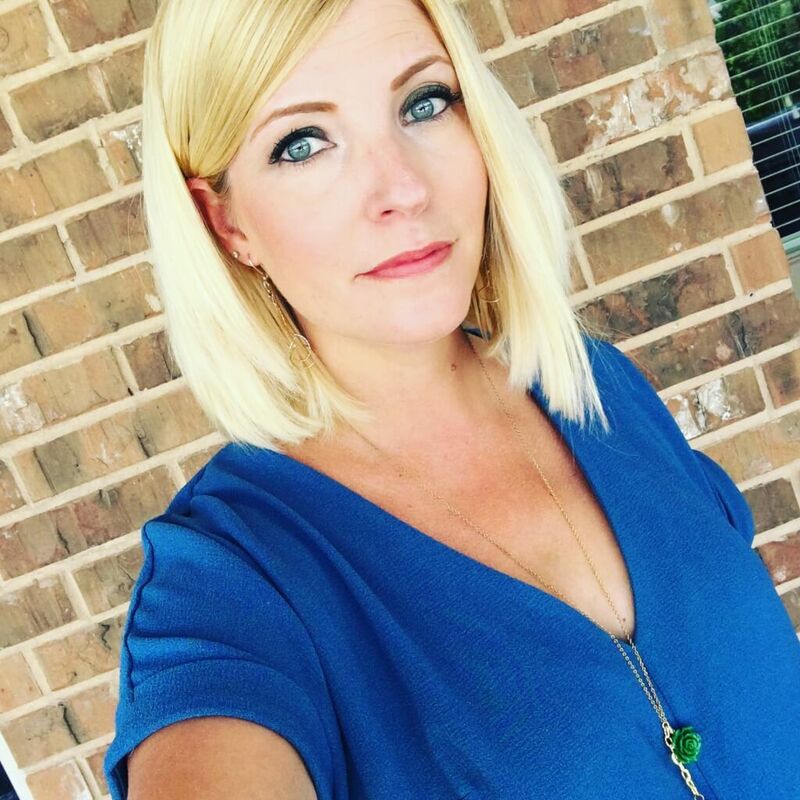 Keep em’ coming Nicole. haha A-a-a-a-cashew. Bless me. Okay, I’m trying too hard to be punny. The recipe is pretty yummy, worth a try!